"We don't know who's playing Santa yet." Extracts from the below interview featured as part of an article published in Cork Evening Echo's Downtown supplement on 5th December, 2013. Tough decisions are part-and-parcel of running a record label with one particular headscratcher posing problems for Out On A Limb records co-head Ciarán Ryan ahead of their upcoming Christmas bash: "We don't know who's playing Santa yet." 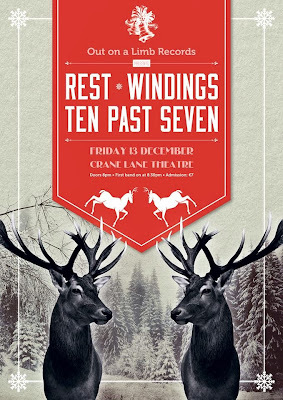 As announced all the way back in October, Friday's Crane Lane rock extravaganza will feature three of the label's long-running heavyweights: doomrock renegades Rest, bogrock titans Ten Past Seven and folk-pop princes Windings. I chat to Ciarán about the upcoming show, another successful year for the label and, most importantly, biscuits. The G-Man: It's been a busy year for Out On A Limb. What records have you guys put out in 2013? Ciarán Ryan (OOAL): We put out four albums this year. In February we put out the second album from Rest, a double LP. It's hard to believe it's only their second album! In May we released Peter Delaney called Witch Bottle. Then we had two albums later in the year with Hidden Highways' début Old Hearts Reborn in September and just last month we put out the Crayonsmith album Milk Teeth which is their third album and second for the label after a gap of about five years since the previous album. It feels like the various releases have been getting a lot of press too. Irish Times, Hot Press, all the various blogs. Not to say that you’ve cracked it, but what do you think has helped you gain a stronger foothold within the media? I think with the traditional press we always got a bit of coverage. Generally speaking most of the albums would have always featured in the Irish Times and particularly Hot Press but at the moment maybe there's a little bit more momentum in that we've had four albums this year and three last year and a couple the year before, whereas things were maybe a little bit more piecemeal before. Now there's that bit more happening regularly with albums every year, things feed off each other and maybe people are more used to us bugging them by sending things to review and stuff like that. What plans are there to keep this momentum going? Yeah but we release stuff as it's ready. We don't sit down and tell bands "We need something ready for April". We know we have a couple of definite releases next year in that Windings are going to do a split album with Popical Island's Land Lovers in February. That's going to be the first time we've ever done a split release with another label or collective so that's really interesting as it's something we've never done before. We've thought about doing it a heap of times in the past and been close to doing it but this will be the first time we've actually done it. We should have an Elk album at some stage next year. They haven't recorded it yet or anything but I'm pretty confident they'll have a new album out and I know Owensie will be working on a new record in the new year. At this stage it's hard to say anything for definite, but we would like to do another three or four albums next year and keep tipping away as it benefits the other bands when the label is busy so it's not like the label puts out something and then disappears for a year. It must be good to be joining forces with a group based in another part of the country? Yeah but to be honest we haven't sat down and talked to Popical Island about it or anything. It's very much the case that, going back into the early months of the Summer, the two bands took the lead on it and Windings approached us themselves and told us that they wanted to do a split release with Land Lovers so it's not like Popical Island and ourselves had a sitdown with lawyers or anything! It's cool and I really like and respect what they do. They're very prolific although they're not a traditional label - if such a thing even exists anymore - and have put out some really good releases and there are some really nice people involved with them so I'm really looking forward to it. It also might mean we are doing shows in venues we haven't done anything in before and building up new relationships. I think it's healthy for labels and collectives to co-operate with each other as sometimes we have a tendency to go off doing our own thing when maybe we could talk to each other more and maybe find we've common problems and could help each other out. For listeners new to the whole process from start to finish how do you go about releasing a record? Good question! I suppose first you sit down with a band and agree to release something. In a lot of cases we’ve had people bring the finished article to us. In the case of Peter Delaney, Peter is someone we've known for years. He had been a friend of the label, played a lot of shows with us and he's based in Limerick so it was a case a few years ago where I asked him to send on some demos as soon as he had them. Towards the end of last year, he called to say he had the album finished if we wanted to have a listen so sometimes it happens like that. Other times it's a longer process where obviously the band has to go into the studio and record. Then it's really a case of sitting down with a band and deciding what needs to be done such as how long will it take to get the record pressed and where are we going to get the record pressed, who's going to do the artwork, what needs to be done in terms of booking shows, promoting the album etc. Different bands need different levels of assistance. Some of the bands on our label are incredibly self-sufficient. Take Windings for example. Windings sometimes have studio time and shows booked and I don't know anything about it and find out about a week later whereas other bands may need more help in that regard. Then it's really about getting the finances in place. There are times when you simply don't put anything out such as the lead up to Christmas as it's so difficult to get shelf space in record stores. Then there are the times when you feel you can best get media coverage such as going into the Summer which is brilliant as people are stuck into the festival vibe. There's no real formula, you just have to take it release by release. I don't know if that answered your question at all! Which step of the process do you enjoy the most or is it just stressful from start to finish? It is stressful but it's all quite enjoyable. I love getting the mixes or master back for the first time. It's not an exclusivity thing, it's more feeling part of the process and thinking "this is really good, I can't wait for everybody else to hear it". That's a really nice part of it. I also really like when the DHL guy arrives with a big box of records from the pressing plant and the nerves when you test-listen to things at home thinking "this better work..." and then when you hold the physical thing in your hand. I'm very much someone who likes their music physically and still get a 'kid at christmas' vibe when I get records. Those simple things are still very enjoyable. 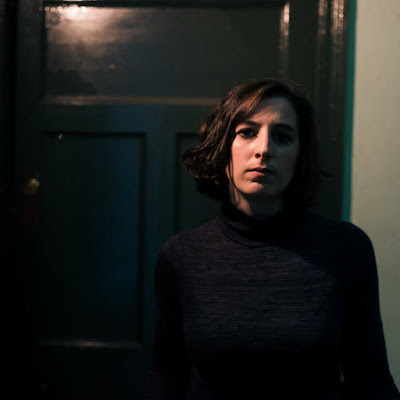 There are two completely different faces to the label isn't there with the likes of Rest and Ten Past Seven on the rockier side and Peter Delaney and Hidden Highways on the more gentle, folkier side. Is this the working equivalent of running two labels? How much of an impact does such a varied roster have on the day-to-day running of Out On a Limb? I think we’ve both got varied tastes and just release bands that we dig. We never set out to be a metal or folk label or whatnot or a label that excludes one genre or another. From the early days, our first four albums were giveamanakick, Waiting Room, Rest and Windings and all four albums were very different to each other. There was no common thread but the province of Munster perhaps. I can take your point with Owensie, Hidden Highways and Peter Delaney that are more folk-tinged than the past. Maybe it's a sign we're getting older. Richard has three sons now so maybe he likes to play quieter music at home these days. At the same time the Rest album from this year was probably the heaviest release we’ve ever done. Physically it definitely was being a double LP! In what ways does that help strengthen Out On a Limb as a brand? I probably don't overthink these things. We rarely make decisions from a commercial viewpoint but it certainly helps. Carl Corcoran on LyricFM for example is constantly playing Owensie, Peter Delaney, Hidden Highways but obviously he's not going to turn around and put on Rest! Usually at our gigs I would recognise most faces but at the Hidden Highways launch in Dublin I noticed there was a very different audience there for them which was cool. Also there were members of Elk, Owensie, Crayonsmith so regardless of the genre they are all coming out to support each other. When it comes down to it all the bands are music fans, just the same as me and Richard. And no matter how different they are, there seems to be a great camaraderie between all Out on a Limb bands who regularly post online in support of one another. The bands are very supportive of each other, even with things like lending amps and providing a sofa or floor-space to sleep on. People into Rest may not necessarily have even thought of a band like Hidden Highways but Rest posting things like "check these guys out" may result in Rest fans clicking on the browser which is great. Actually, when approaching a band as regards possibly signing them and putting a record out, how much does personality play in the decision? It's a big part. We don't see the label as a commercial enterprise. What's made goes back into it, a self-sustainable model but we don't take a wage so we don't want to be dealing with arseholes. It is very important that we like the people as humans as well as musicians and how they fit in. A good example is Elk. After years of trying to do something with them we finally tied Elk down to doing a split 7" with Crayonsmith. We knew Louis and Matt anyway from Hooray For Humans, and we did gigs with them and their attitude was spot on. Just lovely lads. Have there been instances where people haven't been nice? No not really. The majority of people you meet in bands turn out to be quite sound. Maybe I'm just naive. They're probably all at home drowning rabbits or something. Out on a Limb may be a Limerick label but the Cork connections are very strong. How have such ties been both been formed and solidified over the years? The guy that actually gave the label its name comes from county Cork and sometimes gets written out of its history is Con Cremin. Obviously one of the founders was Albert Twomey of Plugd Records who now lives in Cork who left a couple of years back. Dave Ahern who was in Waiting Room, Weevil and Hooray For Humans and lots of other great Cork bands was involved from the early days. In the first year or two we almost saw ourselves as a Cork/Limerick label with Windings and giveamanakick in Limerick and Waiting Room, Rest and Ten Past Seven being from Kerry but nationalised Corkonians at this stage so we’ve always had strong ties with Cork. Elk are on the label now too and we had Hooray For Humans so there have been Cork bands on the label since day one. I’m looking forward to the Crane Lane gig as it’s been the guts of five years since we’ve done a label night down there. And links outside of Ireland? No, I think we are weak outside of Ireland to be quite honest about it, we simply don’t have strong enough links outside of Ireland. That's come down to time and resources and it constantly bugs me. Individual bands on the label do have international connections but as a whole the label doesn't. I'd love to be able to work on improving international links. It's a source of disappointment at times but our focus has been on getting records out in Ireland and generating stuff from there. I always feel the best way of building up links is face-to-face, personal contact and meeting people as opposed to electronic relationships. There's a lot to be said for shaking someone’s hand isn't there? Actually, what do you make of Wingnut Records now expanding into Dublin? It's cool. The more the merrier! I was actually Ray [Cuddihy - Wingnut Records owner]'s boss for a couple of years believe it or not. It’s great that stores have popped up in places that there simply aren't any stores such as Waterford, Athlone so it will be interesting to see how it does in Dublin which has Freebird, Elastic Witch and Tower already. I think it’s great and the fact that it’s specifically Irish. I really like the model and it would be great to see him do well and maybe open new Wingnuts elsewhere in the country. You guys are well served in Cork with Plugd Records but I’m sure there are other towns around the country that could do with a Wingnut. The big Out On A Limb Christmas bash is being held in the Crane Lane this year. Any particular reason why it’s happening in Cork? We haven't done a Christmas party in five years. 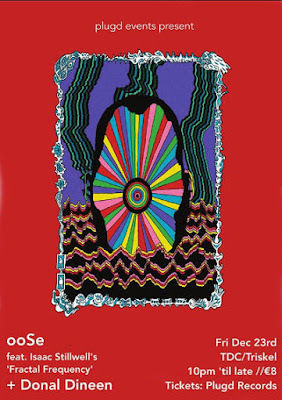 We always have bands that play gigs over Christmas but we don’t generally do a specific Christmas show but the last one we did was in Twisted Pepper about four or five years ago and I think we did one in Whelan's about seven years ago. We did our tenth birthday party in Limerick during the Summer so we thought there was no point in doing something there again so soon. Cork seemed a perfect choice as we hadn't done anything label-specific in four or five years. Also, Ten Past Seven weren't available to do the 10th birthday show so they’ll be able to play and help round off what has been a nice year for the label. We're really happy to be coming down. There's a rumour running the treadmill that we might see the return of the legendary OOAL Christmas Raffle? Top 3 highlights of 2013? We can't say individual releases so! I'll put down all four releases as the first one so as we've never put out four albums in a single calendar year before so that's a highlight in itself. I would say Windings getting nominated for the Choice music prize so it was nice to see them get the recognition after all the hard work they put into it. Number 3? The 10th birthday. That was a great night and experience so it was great to be involved in that.